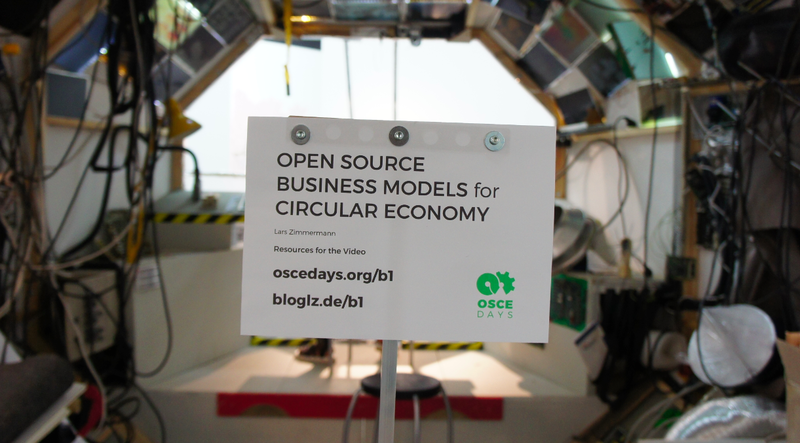 This is an online video course about Business Models for Open Source Circularity. In it’s core is a tool you can download and use for a brainstorming and business model mapping session. The tool is explained in 9 videos. For all videos is a transcript available. Reading is usually faster the video. The series was first published in April 2016 with a few additions and updates added later. The updates are posted above the original series. We suggest to start with a quick look at the updates and then dive into the original series. After about 3 years of work with the tool I learned enough for an iteration. There are things I’d like to add mostly specific things about circularity or sustainability. I would probably add another box about the design of the product explaining that it needs to be openness and circularity friendly (or hacker friendly) because it is simple, modular and based on common available standards. 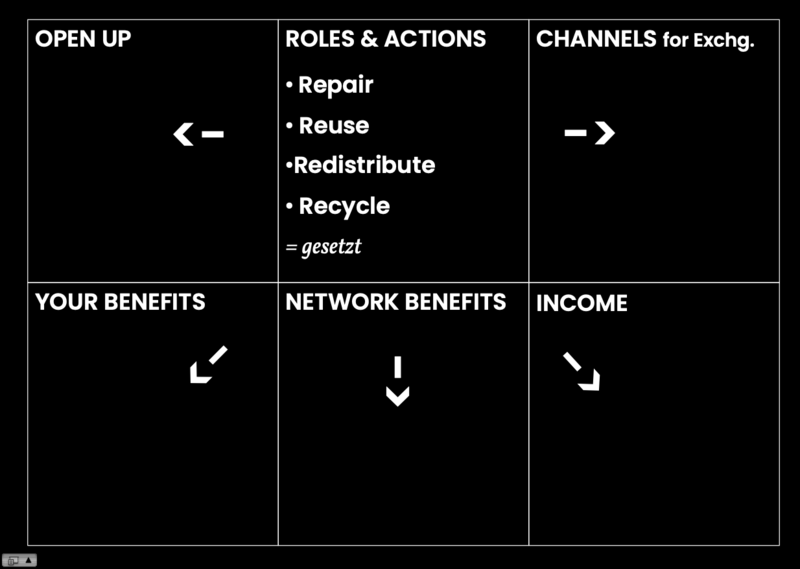 Also it needs to be added that some “roles” are already set with circularity: You will use Openness to enable repair, reuse, refurbish, redistribute, recycle. The Danish Design Center created the Remodel project taking 10 danish companies on to the road to Open Source. They created a packet of tools to help the companies to understand and plan for Open Source. All tools are available for download and use here. And our tool was included. But the the Danish Design Center made a few minor changes and added a better design. Thank you @ChristianVillum for sharing it below in the comments. We presented the tool in a talk at the Disruptive Innovation Festival 2017. The session was recorded and has a quick summary of everything. Some images from the talk are added below into the original series. I am Lars, Lars Zimmermann. I am an Artist & Economist. And one of the founders of the Open Source Circular Economy Days. This is the first video in a video series about “Open Source Business Models for Circular Economy” – which is one of the questions of the “Open Source Circular Economy Days”. What is the “Open Source Circular Economy Days”? 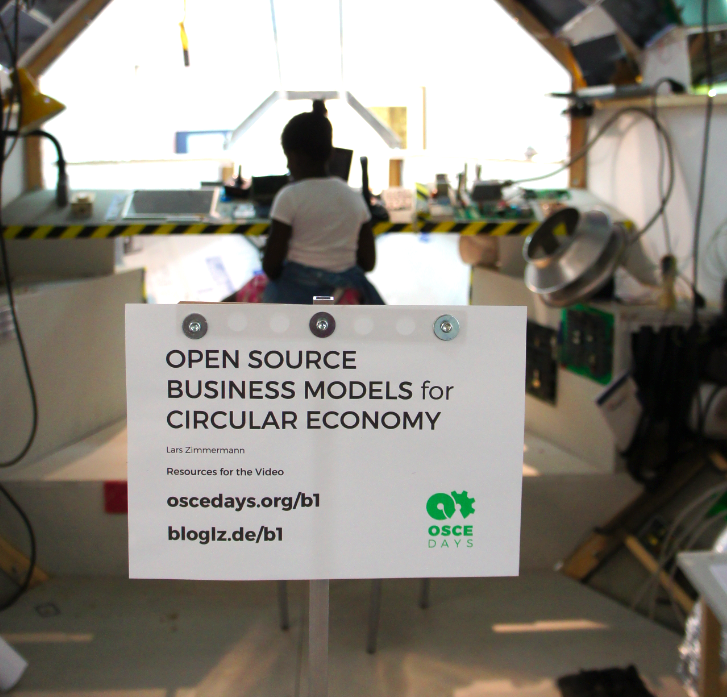 The “Open Source Circular Economy Days” – or in short, the “OSCEdays” – is a global community, (event) and organisation to support the building of a sustainable circular economy, by using and exploring the collaboration methodology of Open Source. What is the Core-Idea of the “OSCEdays”? When we talk about a “Circular Economy” we talk about the idea of an economy without waste! It is different from our current – linear – economy. Where we take resources make products and then throw them away as garbage! In the Circular Economy everything is designed and organized in a way that our products can be repaired, reused, refurbished, and fully recycled. We save resources. Because the materials in our products are the resource base for future products of the same quality. The circular economy works in evolving symbiosis with our bioshpere – protecting it and growing its potentials. But when we take this idea and compare it with the world today. It quickly becomes clear that almost everything in our current economy has to change for this. And not just the designs of our products and services. But also the collaboration methods we use to make and distribute them. Many people in Circular Economy often talk about “transparency”. We need a lot more transparency to make our economy circular. But the next minute they start to talk about “trading secrets” and the “need to hide knowledge” in today’s economy. So transparency isn’t really an option. And here is where Open Source comes in! Because in Open Source we have transparency. It is transparent how things are made. And there is also a number of successful businesses and products! That are successful BECAUSE not DESPITE they are open. What can the circular economy learn and adapt from this? This is the question. So. What Is Open Source? Last year on a weekend Sam Muirhead and I did a video on this. You can find the link to this video in the resources. But to sum it up: It basically means to have “Building Plans” in the public. It is openly visible how things work and how to make them work. Things are shared to enable others to study, use, modify, make and distribute them – also commercially. In the world of software Open Source is very successful in many areas. And areas outside of software are also catching up. Open Source has a clear Definition, a growing community, and a good number of successful businesses. But there are also misconceptions out there about Open Source. Like “it is all DIY” – Do It Yourself – or “Everything Is For Free”. It’s not! On the contrary: In software Open Source is foremost a collaboration method between experts and professionals that are paid for their work. The Open Source Software “Linux” is probably the most important and most used software in today’s world. Wherever you are watching this right now it is pretty likely that very close to you is one or more devices running Linux. Like this one. Or this one. The whole web is based in its critical infrastructure on Open Source. And also big companies with incredibly sophisticated software like Facebook for example would not be possible to this extend without Open Source. There is Open Source everywhere in Facebook. Without Open Source the web would probably be where it was . . . I don’t know, maybe ten years ago? So can we take this methodology to enable the building of a Circular Economy? To make quicker progress with it? Or maybe to make it possible at all? This is what the “Open Source Circular Economy Days” are for to figure out. With a global community. And one of the riddles we have to solve is Business Models. What are working “Open Source Business Models for Circular Economy”? It is true. Bringing Open Source to new areas is often not trivial. You need to be creative! Because “Open Source Business Models" is not what we are teached around every corner in our present world. So in this video series I like to share a little bit of my perspectives on “Open Source Business Models.” The goal here is not to give an exhaustive overview. It is to seed some ideas insights and clues into your head. To enable you to engage in your own creative process. In the next 2 videos – number 2 and number 3 – I will share some core ideas and examples I want you to be aware of. And starting with video number 4 I will present you a tool. Called the “Open Platform Design Flowchart”. This tool is supposed to help you to understand and ask some key questions when designing an Open Source Business. Circularity & Brands, Everything Open? The first idea I’d like to share is: You may not need to Open Source everything! Maybe it is enough if you open up just the parts that need to be open to enable circularity. It is true. Not even in the world of open source Software everything is Open Source. People write Open Source Software using “closed source” software languages for example. Or let’s say you are building a piece of Open Source Furniture maybe a desk. 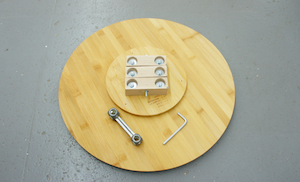 The tools you will use and the materials – the wood and the bolts for example – will much likely not be open source. But everyone can see you are using standard tools and standard materials. And everyone can get those and build the Open Source desk. What parts of the product or process need to be Open Source to enable circularity? 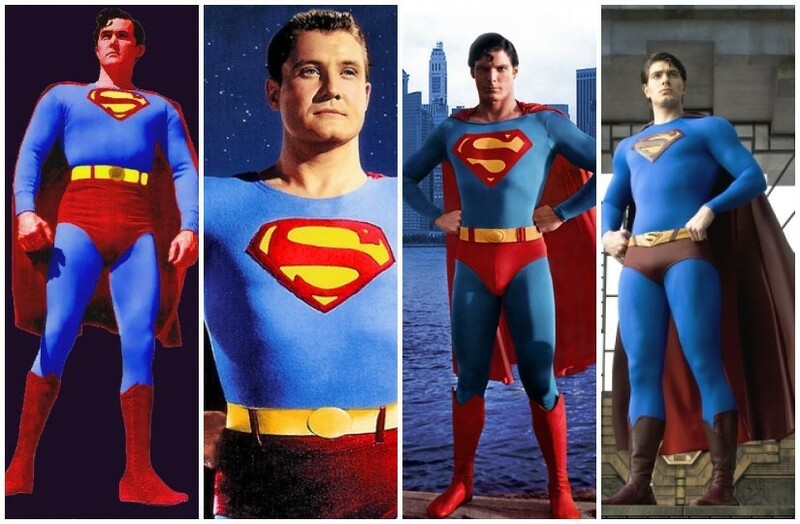 Think about Superman for a minute. And imagine an action figure – a toy – of Superman. Superman – the character – is owned by Warner/DC. It is closed and copyright protected. But that is not a problem for an action figure of Superman. Let’s imagine for a minute. That this action figure is circular. It is made from a “magical” material that is fully recyclable. Then this fact needs to be Open Source. It needs to be Open Source that the material is used here in this action figure. And the material itself also needs to be Open Source. As the whole process for the recycling. That would enable the recycling and circularity of the action figure! Because it could be recycled everywhere by everyone capable to set up the recycling process. Everyone would be enabled to reshape the material. But only Warner/DC can make another Superman out of it. And sell it as Superman. Because Superman is a closed brand owned by Warner/DC. And this is the moment to mention that in Open Source trademarks are still protected! They are important as always! Because when the building plan is open for everyone it still matters who actually turns the bits into atoms. Who makes the physical object? How is the quality? Is it warranted? And who is responsible in court when the toaster sets the house on fire? Brands are important to communicate trust and responsibility. And to make a difference. Here is another hypothetical example: Imagine you have a fantastic machine in your factory that is able to draw the Brand on this Toothpaste Tube in less then a second. That process does not necessarily need to be Open Source to enable the circularity of the Tube. But it should be Open Source how people can wash away the ink win it back and reuse it or biodegrade it. And the ink itself should be Open Source too. So others can reuse it. The best case scenario is that you have used the ink in the first place because it was Open Source. But again branding itself and the maybe sophisticated process to paint it on the tube can remain closed and yours – can remain your competitive advantage. Bottom line: Find out what parts need to be Open Source to enable circularity. And open them. This was the first key idea I wanted to share. Find a way to structure your company product or project in a way that it is successful BECAUSE it is Open Source not DESPITE of it. What do I mean with this? If you chose the Open Source road new possibilities pop up. For collaboration and innovation for example. Try to make those work for you. We will talk about this more in the later videos. But the key point to take away now is: Open Source is not necessarily a “gift” or “charity” to the world. In Business Open Source is sometimes an even “aggressive” strategy for growth or competition! Google developed Android as Open Source to be able to catch up with Apples Iphone. Because Android was Open Source it enabled a lot of companies to contribute to it and to use it. Resulting quickly into an ecosystem with even more apps then Apples App Store. And Google placed its Google Play Store right into the middle. Android is the most spread computer operating system in the world today. By far! Another example is Tesla Motors – the famous manufacturer of electric cars. A while ago they opened up their patents. Why? Electric Cars need a huge infrastructure around them. They need chargers and pit stops available everywhere. No company in the world can build this alone. So opening up the patents enables an ecosystem of commercial actors to build this infrastructure. And the stronger this infrastructure gets the more people can use electric cars. The potential customer base for Tesla Motors grows. These were just 2 examples of how companies can be successful BECAUSE they are Open Source! Not DESPITE of it. 2 – Structure your company in a way that Open Source is an ADVANTAGE. The advantage though often lies in the possibility of growing an ecosystem. An ecosystem you can benefit from. Some ecosystems can be described as Platforms. And this is what I am going to talk about in the next video. Platforms. I will also introduce you to 2 successful Open Source Companies. And I will use these examples in the later videos again and again. To make things understandable. Idea Number One: Platforms or Ecosystems. Successful Open Source products often work as platforms. They enable other actors to do something. An ecosystem with different in-ter-de-pen-dent actors emerges around the core product. And all contributions make the platform stronger and more useful for everyone. There has been written a lot about platforms. Some people tend to think that in the future everything that can become a platform will become a platform. As platforms are a fantastic way to collaborate. And openness can be the perfect enabler for healthy platforms. I will give you two examples for open source platforms. One is software the other is hardware. And I’ll refer to this examples in the later videos again and again. I’ll talk about Wordpress and Arduino. If you know them already you can skip the first third of this video. If not stay with me. The first example I’d like to talk about is Wordpress. 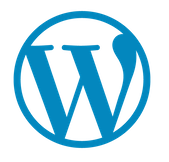 Wordpress is an open source software to create blogs and websites. You can just download the software install it and you have a basic website running within minutes. Wordpress is incredibly successful. 24% of all websites today are built with Wordpress. 24%! If you have followed the links with the resources for this video you have just been at one. How could Wordpress become so big? Because it is Open Source! There is an incredible rich ecoystem of commercial actors around Wordpress constantly growing the system decentralized. If you decide to hire a web designer to set up a professional website for you there is a good chance this person will set up a Wordpress page for you. The Web designer will download the software install it and because it is Open Source will be able to make all sorts of customizations for you. And maybe this person will also share this customizations with the Wordpress Open Source community. To get feedback fame new partners new customers or whatever. There are thousands of Open Source “Themes” and “Plugins” for Wordpress everyone can just download install and run. They are contributed by independent companies. And with every contribution Wordpress becomes stronger and more useful – allows thousands of professional web designers to do their jobs better! The core product “Wordpress” gets better all the time. The name of the company behind Wordpress is Automattic. And they make money in a lot of different ways benefiting from the ecosystem: They sell web hosting support premium accounts they run ads and do a bunch of other things you can find out about by clicking on the link provided in the resources for this video. WordPress is open-source and free. How can Automattic make money if they are giving away WordPress for free? OK. That was a software example. I’d like to give you another example. A hardware example. From electronic hardware. This is an Arduino. A product of an Italian company. And maybe the biggest Open Source Hardware Platform in the world today. It is a microcontroller. If you are not familiar with electronics let me briefly explain, to you, what this thing is. You have here, on one side, Inputs, where you can plug in all kinds of things, like for example, a sensor for temperature. And on the other side, you have all kinds of outputs, where you can plug in actors, for example a motor with a fan. The middle part has a programmable chip. You can program it, and say things like: If the temperature sensor on the right says, it is 30 degrees please turn on the motor with the fan on the left side. This is what an air conditioner does. So you have built an air conditioner. And you can add a rule like: if the heat goes up to 60 degrees or higher, please turn off the motor, so the air conditioner does not set itself on fire. A microcontroller like this is part of every “semi-intelligent” machine in your home – there is one in your washing machine, in your micro wave and so on and so on. The difference is, that the Arduino is Open Source. The hardware is Open Source. And the software needed, also. And the most important thing is, that the whole culture, established around the Arduino breathes Openness! If you go to the Arduino website, and visit the Arduino forum there, you’ll find over 1 Million entries, where people shared solutions, and ideas, on how to use the Arduino. People, everywhere in the world, build all kinds of crazy projects, using Arduinos: From making plants doing phone calls, to satellites, to cars, to drones, to air conditioners, to wearables … the list is endless, really. Hobbyists and Professionals use the Arduino. I encourage you, to do an internet, image, search. Type in “Arduino Projects”. And you’ll get an impression, what is possible and happening. And many, of those people, share, what they are building, and how they do it. This means: If you want to build an irrigation system with an Arduino, you go online and find hundreds of projects, that already did it. And you can learn from them, and maybe even download existing source code. You will be much quicker. And you’ll be able, to do a lot more. Because you can benefit, from this – Open Source – ecosystem, and its culture. There are a lot of Hobbyists and Maker projects, using Arduino. But also professionals. My guess is, that the majority of all this new “internet of things” start ups today, build their first prototypes, with Arduino. Benefiting, and, often also contributing, to the ecosystem. And every contribution, makes the core product – the Arduino – ever more useful, for everyone. But this is just the first part, of the story – software and use cases. The second part is, that a lot of other hardware companies, get involved with the ecosystem, by providing hardware, to combine with the Arduino. The openness of Arduino makes this, easy for them. An example for this are “shields”. A shield is something, you can stick on top of the Arduino, to give it new powers. For example: A regular Arduino comes without WiFi. But you can buy a shield, from another company, put it on top of the Arduino, and add WiFi. All these ideas and products, added to the system! Arduino, could not do this alone. But every contribution makes the system stronger. Arduino an ever more useful tool. And Arduino is selling Arduinos. So here, we have a product, that really exists and works – commercially – BECAUSE it is Open Source. The whole different it makes, the whole product it is, it is, BECAUSE it’s Open Source. Update (Nov 2018). Here is a simple map of the Arudino platform ecosystem made with the tool that is introduced below. It is in german. You can find more context on this image here. And this leads directly into the next core idea, I want to share. 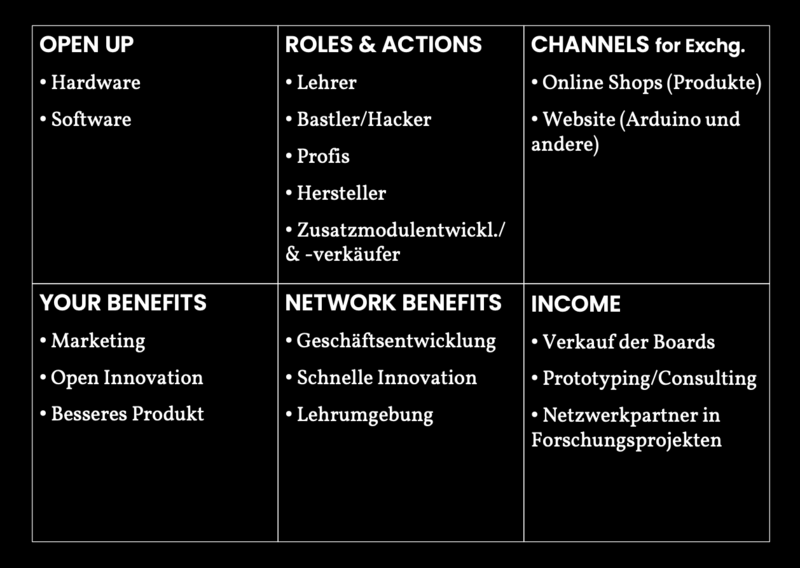 And this is: That many products, need to be reinvented, to work as Open Source products. A lot of the products, we are using today, will business wise, not make sense as Open Source products! It won’t make sense, to just publish the plans, change the license and go on with business as usual. As my great colleague, Sam Muirhead [http://cameralibre.cc], always says. Products have to be made, to work as Open Source products. You’ll need to connect them differently, to a different kind of ecosystem! For some areas, this will mean, they have to be entire different products. So they are products, that benefit from openness. But luckily, for the Circular Economy, it is the same! We have to reinvent, the products, along with the ecosystems around them, to make them circular. So why not do the Open Source part and the Circular Economy part, in one rush?! And maybe, and this is the belief of the “Open Source Circular Economy Days”, we NEED to make them “Open Source”, in order, to make them circular. I want to give you another example. Or concept. Last autumn I slowly started to develop my own hardware company. It is called Mifactori. We develop Open Source circular furniture and other objects. 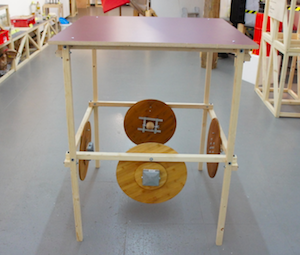 For some activities, we are inspired, by a project called Open Structures. What we do, is, we use a 3cm Grid, in all our designs. This grid is derived from a toy. 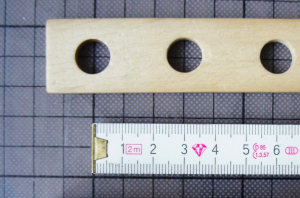 Whenever we drill holes, into something, it follows the measures, of the 3cm Grid. The same grid, is in all parts, we produce, for every object, we make. And this means, they all fit together. Always. For an, infinite number, of constellations. This means, you can win back, the parts, of one design, and reuse it for another. Everything is modular, and reusable, for an endless number of different things. We call the 3cm grid the Berlin Grid. Because a 3 looks like a B.
PAINTS A MIRRORED “3” IN THE AIR FROM TOP TO BOTTOM THEN BACK FROM BOTTOM TO TOP AND ADD A STROKE TO TURN IT INTO A B. Here you can see some early prototypes and products. You see, it is really early prototypes. But the key thing is: We open the grid. And all the parts we make. We invite, and enable, others, to copy, our solutions and ideas. And to use, the same grid, in their designs. They can benefit from us. And if they publish, what they do, we can benefit from them. And here comes the interesting thing: The more people, use the grid, the more manufactured parts, become available. And this results into: A network effect in the parts! We experience, this here, in our little laboratory already. Every time, we make a new part, the number of things, we can do, with all the others, grows! You probably know this from Lego. Every time you add new bricks, to your collection, more and more complex things become possible, with the bricks you already had. When several people and companies here in Berlin, or anywhere, use the same grid – everyone wins! Including our customers. Because the products, they have in their homes, grow in possibilities, all the time. With every contribution. New ways to use, hack, improve or resell the parts, are born. All our products become richer. Enabled through a whole, decentralized, open ecosystem of independent innovators. You might say now: Hey, but one day, the market is full! Then you will compete with each other. And I say: Yes. Maybe. Probably. Hopefully. Truth is: I wish, we come this point! Because it would mean, the ecosystem has become big, strong and useful for all kinds of commercial actors. And if the ecosystem has grown that much, Mifactori has probably grown, a lot with it. And I think, that with the network effect, in the parts, this market might have, much more possibilities, than we expect. It might be much bigger. And on a side note: I like to think, that this kind of, openness enabled network effects, is the key road towards a circular economy. And to make a last remark on this: With the growth of the ecosystem, we at Mifactori will probably have learned a lot, about smart and elegant uses of the Berlin Grid. Our experience will give us, a good head start. Our brand will be placed. And if not. What is the point of us being in the market?! – If you produce pants with pockets you are not alone. There are thousands of other companies producing pants with pockets. You compete with them, but not on the fact, that your pants have pockets. But on other levels, like quality, communication, reach and so on. And, I, am willing, to engage, in this kind of competition with other companies, using the Berlin Grid. Especially with, the circular dynamics, we are in, then, together. Most fears people have when they think about opening up, are irrational! Not thought through. These fears, or objections, are strangely hammered into our brains: “You can’t make money if you don’t have a patent.” That’s, what people tend to think. But look around, in your house, at all the products. Most of them aren’t patented. The chair, the shirts, the dishes, the carrots, the buckets, the bread and so on. Most of the companies, that made these, are profitable. The problem with this fears, and unreflected objections is, that they prevent us, from having really interesting thoughts and ideas. And from creating really interesting new products and businesses. It takes courage. And vision. To take action, despite of the fact, that you will hear this fears and objections, around every corner. This video series is for the courageous and visionary. Ok. To sum it up. Mifactori and the use of the, 3cm Berlin Grid is another example for a product, made to be Open Source! THINGS YOU CAN STILL OWN! But, as I just, made a more “political” bit. I’d like to add another thought here. And this is: That Open Source will allow us, to have a Circular Economy, where we still have the option, to OWN our stuff! In the Circular Economy videos and articles, provided mostly by big companies, you often hear the idea, that for the circular economy, we need to change our relationship to ownership. “Access over ownership” is the used therm. You will not own your washing machine anymore, or your furniture, or your phone, or your clothes! No. They will be still in your house. But they will be owned by a company. So the company doesn’t sell you, the washing machine. It sells you a defined number of washes. It does not sell you the phone, it just sells you calls. It does not sell you the hearing aid, it just sells you, sounds. I think “access over ownership” can be smart and make sense. But, if, it were the only option, we have for a circular economy, I think it would be very problematic. But of course, I understand, that the model makes sense for big companies. Because this is the only way, they can talk about a Circular Economy, without having to talk about Open Source. If they own the washing machine in your house. They can make sure, it ends up, in their factory. Where they repair, refurbish and recycle it. Behind closed walls! No need, to enable the outside world to repair, refurbish or recycle. No need for Open Source. But first of all, “access over ownership” does not work for everything. And if it were, the only option, for the products, where it could work . . . I just wanted to say, that it is, very problematic, if the only option. And that, Open Source, would allow, to have a washing machine, that is circular, but you can still own! Because when it is transparent how to repair, reuse, refurbish or recycle it – everyone can do it. Pick the service company, you like, for the job. Ownership is something good. Because, it entails individual freedom. In a world, less free, it would probably be, a lot easier, to create a circular economy. Top down, by force. But I think, the goal we have, is to have a circular economy, and a free society – both, at the same time. And Open Source can allow this. – It is, about decentralized collaboration. Ok. With this, I end video number 3. That tool is supposed, to help you, to reinvent, or rediscover your project, product, service or company, as a potential open source business! The next video Number 4, starts with an introduction to the tool. (2) IKEA reinvented as Open Source by @seigorobinson for a 2017 Disruptive Innovation talk. A detailed explanation for all the “Post-Its” can be found in this public document. Detailed written explanation for this example is available here. 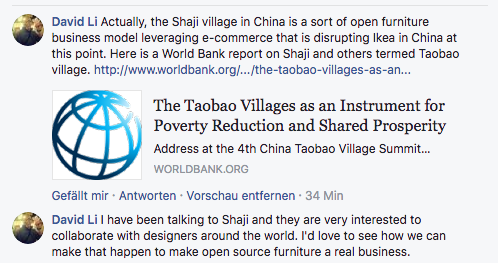 | There are very interesting comments on the IKEA example shared below in the comments. 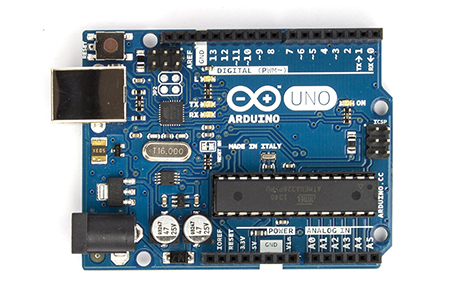 (3) An example for Arduino is shared above or click here. Ok. In the first videos of the series I shared some core ideas I wanted you to have in mind before I go to the little tool I created. The name of the tool is “Platform Design Flowchart”. It is made to make people ask the right or some questions about their idea product project or company in order to help them to see it as an Open Source project or business. In the resources for this video you’ll find a graphic tool – a table. The tool is in an early state. It is made to grow over time. I invite you to add to it in the resources. Especially to the list of examples. Ok. I hope you have it open by now. You see a table with six squares. Each square is about one basic question. When you answer the questions when you fill in information you’ll paint a picture of an Open Source project or business. 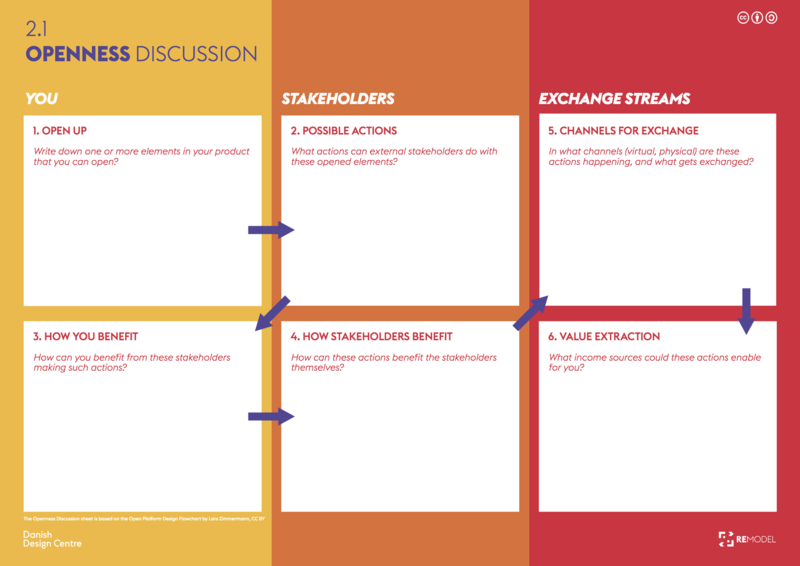 This methodology is inspired by the famous Business Model Canvas by Alexander Osterwalder and Yves Pigneur. And the idea to develop it further to a tool that helps to invent open platforms I got from Simone Cicero – who has also developed a tool to design platforms that you can study on his website. [http://meedabyte.com] The link is in the resources for the video. 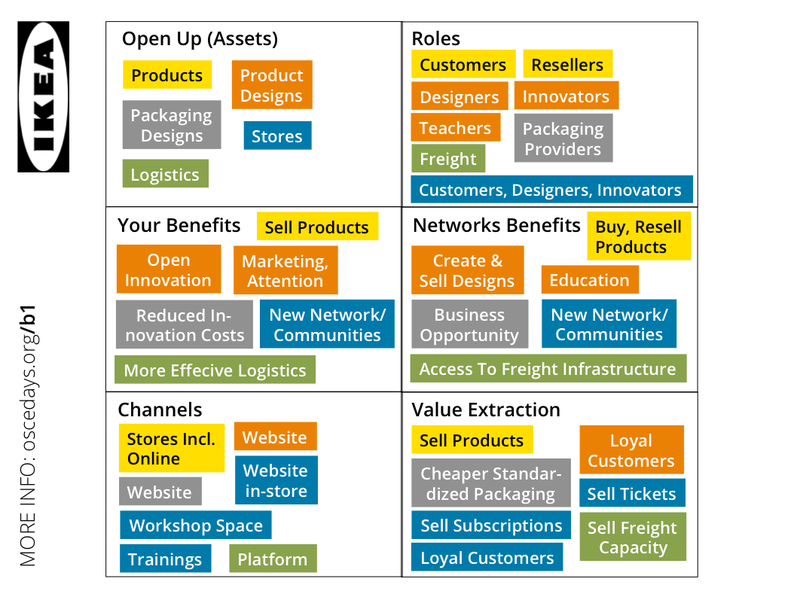 If you are in general familiar with the “Business Model Canvas” this will help a bit with the tool I am going to present you now. Each of the following videos explains one of the squares. And presents a list with examples. What key assets to open up or share? So the question is: From all the things you own or use to run your company or project what to put out in the open? As said in video number 2 - you don’t need to make everything open. Just pick what makes sense. The tool is made to help you discover what makes sense. You can map the potential effects of opening up for every single asset. There are a many different ways of sharing or being open. I’ll name a view examples. The Building Plans or Design Files – In Software Open Source projects share source code. Source code is basically a building plan for software. On the website GitHub [LINK] for example are hosted thousands of projects to study and contribute. When we talk about hardware possible design files are CAD files or other technical drawings. But basically all documents needed to understand and manufacture the hardware [LINK TO BEST PRACTICES http://www.oshwa.org/sharing-best-practices/ ]. Sewing patterns for shoes are another example. Plans of your Workshop of Factory – You can share information about your factory or the processes you use to build your products. Spark Fun [https://www.sparkfun.com/static/about ] for example shared design files for their new factory. And in many Fablabs you can find an open source 3d printer. For example a RepRap [LINK http://reprap.org/wiki/Build_A_RepRap ]. And on the website of the Fablab the information that they have one. Your Workshop To Use – Fablabs [LINK https://de.wikipedia.org/wiki/FabLab] and Makerspaces are popping up all around the globe. They are usually spaces where you can find machines to build “almost everything”. 3d printers or laser cutters for example. And you’ll probably find someone there who will be happy to explain to you how the machines work. And give you access to it. For a fee. That might be their business. It is an open factory or workshop. Ok. So much for Square One. When you think about all assets you have in your project or company you can probably think of more things to open up. You can be more specific. Which will help with the following squares. What others can do with it? The key thing about opening up assets – as we have done in square one – is that it enables others to do more with your product as just consume it. A larger variety of actions becomes available. A good way to think about this is “Roles”. You offer other actors to take on new roles. For example: If you just sell furniture you offer others to be “consumers” or “users” and maybe “resellers”. But if you open up the plans of the furniture you add the potential roles of “teachers” that use the design to teach or “designers” that creatively engage with it or “manufacturers” than can make them independently. Probably with every new asset you open up new roles become possible. Check for all of them what roles they could enable. If the roles then really engage an ecosystem can emerge where – if the premises are designed right – everyone benefits from everyone. Different actors contribute independently to the progress growth and stability of the ecosystem. It is the goal of this tool to find out what roles you should enable and support in order to let a healthy ecosystem grow. You can map out all potential roles here in this square. To gain an overview of the potential ecosystem. In general roles can be taken by professionals or hobbyists. But of course if people can make a living with it they are more likely to take on the roles and to dedicate a lot of time to it. Teachers & Students – Last summer I met a person who owns a factory that builds computers. We were discussing Arduino [http://arduino.cc] and he said that starting this year the apprentices or students in his factory will use Arduino. It makes sense to connect to a big ecosystem of knowledge and people in education. Arduino is the better tool for “Teachers”. Independent Developers – Developers or designers can work with your design and add to it. Open Innovation [https://en.wikipedia.org/wiki/Open_innovation] is the term here. Maybe they just post ideas or comments somewhere. But maybe they create whole new iterations and publish them. Those you study and learn from. I told you in video number 3 about Arduino and that many people share their Arduino projects online. And that some companies build extra products to combine with the Arduino making it an ever more usueful tool. Those “independent designers” don’t “rip off” the Arduino. They contribute to the ecoystem around it. Contributors – “Independent Developers” are of course also “Contributors”. They contribute to the general growth of the ecosystem. But with an open workflow you can also engage all kinds of direct contributions to your project. A famous example is Wikipedia – one of the worlds largest Open Source projects. The whole encyclopaedia is written by volunteers. This will not be the case for companies of course. In most Open Source projects most work is done by employed workers. Please. Don’t approach Open Source as “Crowdsourcing” – as getting people to work for you for free! That is not the idea! But yes the fact that you can enable third party developers to directly contribute to your core is important. Many companies contribute to the Linux kernel [https://www.linux.com/community/participate]. IBM did for example. Because they use the software in their hardware products. So they contribute to make Linux useful for them. And by that they make it also useful for others. But Linux and other open source projects allow also other contributions. Like blogposts graphics tests reviews marketing and so on. “Contributors” can be motivated by very different things. We will talk about this in square number 4. Manufacturers - Open building plans enable others to manufacture and also distribute the product. Open Desk [http://opendesk.cc) for example enables a huge network of fablabs all over the world to manufacture their desks locally. Enabling manufacturers can – for example – make sense if you have a service that you want to provide for a physical object. But that you don’t want to produce ship and warrant yourself. But there are more scenarios where you can benefit from enabling manufacturers. Technical Supporters – With open building plans it is easy for others to support the product. They may repair it for example or update it. Your customers will like that. Because it makes them independent. If you hire a web designer to set up a Wordpress for you you will not depend on this designer afterwards. He is not the only one that can update the page. Because the source code is open. So you can hire another designer to fix bugs update the page and so on. Recyclers Reusers or Remanufacturers – This is more hypothetical right now. I don’t have a real open source example for this. But of course. If your product is made for recycling reusing and remanufacturing and you are open about it people can do the job. This may result into a better and more useful product for your customers. For one thing: It might be easier to resell for them. Ok. So much for the examples. They are all very general. When you dive into your specific company or project you will be able to be more concrete and to name specific businesses for example. Which is good. Map out your partners for decentralized collaboration in an open ecosystem. Ok. With this in mind lets go to the next video. Video number 6. It is about the 3rd square in the tool and the question: How do YOU benefit from the roles and their actions? How Do You Benefit From The Roles and Actions? If you open up and enable an ecosystem of other actors it should be something you can benefit from. So this square is about potential benefits from going open source. It is important to find out which benefits you want to activate for you. Remember in video number 2 and 3 I said that you should create your project or business in a way that it works BECAUSE it is Open Source not DESPITE of it. And this has a lot to do with the benefits you can activate for you with Open Source. I will go now through examples. In the resources for this video might be more by now. Keep in mind that in your project or business you will probably not be able to activate all of these benefits. But some. Ok. Here is the list. Better products – with more Possibilities – When people can add features to your product or come up with new surprising and openly available uses for it – the product gains in possibilities! Remember the incredibly rich Arduino or Wordpress ecosystems or the Berlin Grid I explained in video number 3 when I was talking about platforms: Openness enabled network effects that elevate the product constantly. Better products – easier to Maintain – If you have a circular machine or object in your house with open building plans it will be easier to repair or maintain it. Customers can do it themselves. Or – probably more likely – find and hire someone to do it. Better products – Easier to Trust – In the world of software it is quite clear. If you really want your customers to trust the security of your software you make it Open Source. Independent experts can check and confirm then that there are no backdoors to spy on you. But also with analogue objects – when they are open repairable maintainable and so on – it is easier for customers to trust the product. Because they can control it. I trust Wordpress. Because I know. Even if Automattic goes down next week. I will be able to find someone to take care of my pages. Because the source code is open. Longevity and trust is enabled. Better products – easier to Resell – If the products are easier to support repair reuse and to recycle – they might also be easier to resell. The better investment for the customers. The better product. This can be a benefit for you. Especially when you take part in the whole reselling business. Better Product Innovation – If you are part of an open ecosystem where people can innovate all the time and everywhere you can benefit from that. I’ll give you an example. When Arduino entered the market a lot of people started to connect it to clothing. Creating smart wearable’s. Something Arduino did not see coming. The Arduino is a bit big. And tricky to sew on. But other companies discovered the potential and created smaller Arduino clones easier to sew on. Arduino learned from that and created an own product like this. The Arduino Lillipad. A now famous tool in the fashion tech scene. Before they created it they knew there is a market for it. Reduce Costs for Legal Issues Security Measures and Research & Development – If you are open it can help to save money. Patents for example are expensive. And if you try to keep everything a secret – when you make all your partners sign complex secrecy agreements – and you take all kinds of measures to make sure nothing slips through your factory walls – this can all become expensive. Also if you do your innovation indoors and closed and bring a finished product to a market untested it is risky. But if you do the innovation in the open to begin with you can get constant feedback and pointers to the right direction. And maybe you picked up the idea from your ecosystem anyway. Transform customer hacks into real products. – So being in the open can save you a lot of money for different reasons. I’ll name some more in the next point. And you can use this money for other things. Nathan Seidle the founder of Sparkfun says they don’t file patents but rather use their resources to innovate all the time and being faster than everyone else. Reduce Costs for Collaboration Education and Recruitment – Having an Open Source workflow can make you much more efficient. I talked about this recently in a blogpost about the way we work in the OSCEdays [LINK] where we do everything in public. For example it is easier for us to onboard new collaborators. Because we don’t have to explain everything over and over again. Everything is there to pick up for those that want to get involved. Adding new people is a lot easier. Good documentation can make you also more independent from certain people – like mighty knowledge keepers. Because everyone can look up how things work. This can result into a more stable project and a better atmosphere in it. Reduce Marketing Costs – Viral Marketing – People browsing the web are looking for good resources. If you provide useful information they are more likely to share it. Also if you enable a community to do interesting things – they will start to talk about it. I have never seen an official Arduino add. But so many different people told me about it. Also the more people take on the Berlin Grid the more people will explain it to their customers and communities. A decentralized marketing campaign where every company involved benefits. Grow Green Reputation – The Open Source Circular Economy Days is not the only community in the world that has understood that Openness looks like the potential key driver to a truly sustainable circular world! The number of initiatives is growing quickly. And just Openness alone already has a pretty good reputation. It is connected to education democracy and freedom. All very positive concepts. And the more it gets connected to sustainability the more green reputation it entails for those who are open. Ok. So much for some possible benefits for you. Many of them are very general. If you go in to details for your specific project product or company you’ll probably find much more specific benefits. It is important to understand that most of these benefits are much harder or even impossible to activate with a closed source approach. So building on this potential benefits is key – or at least very interesting to think about. How can the roles benefit? 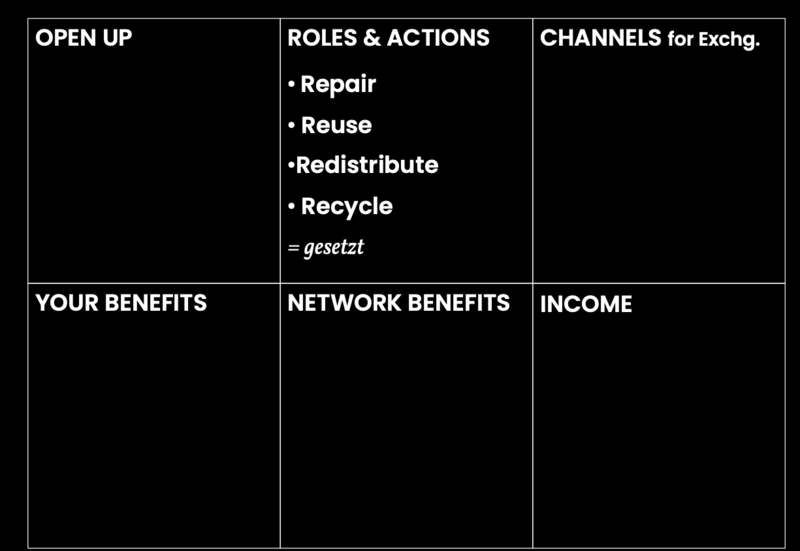 In square two of the tool we listed potential roles and actors of the ecosystem. In this square we ask for the potential benefits THEY could have from becoming a part of it. This will allow us to truly understand how to motivate them. And make sure that everything is in place for them. What is in for them? Many of the benefits for the roles are the same as the benefits for you. When an ecosystem results into a better and stronger product this is something all parties involved benefit from – from customers to companies. I will now list potential benefits. Again very general ones. For a specific case you will probably be able to name more specific benefits. A longer list with examples you might find in the resources for the video. can make an income by adding to the open ecosystem or being part of it they will be able to dedicate a lot more time. And they have an incentive to deliver good quality. There are a lot of ways how people can make an income. We will talk about this in square 6 also. Sell things repair them support them recycle them and so on. Arduino is again a good example. Remember the shields I talked about in video number 3 and also the people who are doing professional prototyping with Arduinos. Do an existing job better – If professionals use richer products they might be able to do their jobs faster and cheaper and deliver a different kind of quality. For example when teaching with an Arduino you have this huge and dynamic knowledge base at your disposal. And with Arduino students also learn how to use the web to solve engineering problems. The other example I gave is Wordpress that enables independent web designers to set up great looking websites very quickly. They find a stage – An open ecosystem comes with communication and attention. “Stages” to step on to get visibility and gain social capital. And visibility and social capital can often be transferred into economic capital. If they see you being an expert in a field they might hire you. There are many examples from the software world where companies first look at contributions someone made to an open source project before they hire. But maybe they weren’t even looking for a new employee. But found one while checking out some resources. Ok. So much for the potential benefits of the other actors in the ecosystem. If you start to think about specific projects you’ll probably find more specific benefits. Please feel free to share them in the resources for this video. Once you have understood the benefits for the other actors you can make sure everything is in place so they really start to engage. Before I go now into square number 5 I just want to make a general remark about square 5 and 6. So they are about things that are exchanged in the ecosystem. Like products knowledge trust and money. As everyone knows a business model is not just about money. It is the whole process and structure how a company is established in and connected to a network of other actors. Retailers manufacturers designers workers customers and so on. The first 4 squares of our tool have been about this. Now we are figuring out exchange in the ecosystem. Where does it happen? How to participate? And also where to extract value? Products knowledge trust money and so on is exchanged through channels. For a physical item like a T-Shirt a possible channel is an online shop. Your own. Or someone else’s online shop for example Amazons. A local shop in the streets of your city is another channel. The shop can be fancy. Or less fancy. Information for example is exchanged through websites or forums or workshops. So in square number 5 we are going to list all channels that allow your ecosystem to exist. This will help you to understand it and secure it. In general you can make here a distinction between channels that are run by you – like your own online shop – or channels run by others – like Amazon. For example: Knowledge about how to use an Arduino is available on many websites and in many workshops all around the world. But there is also an official Arduino website. And official Arduino workshops and events. When we will talk about income sources in the next square this distinction can be important. It is often easier to extract value from a channel you run yourself than from someone else’s channel. Let’s have a look at the channels. I will name a view examples. More you can find and contribute in the resources for this video. One more time: I will mention very general channels. I will say “a forum” for example. But when you map out your channels you can be more specific. Not “a forum” but “the fairphone forum” for example. Websites – for the exchange of information attention and trust. Interactive Websites – like forums wikis or collaborative tools like Git. Own Webshops – SparkFun for example started as a webshop and still has one. Webshops of Others – Amazon is an example everyone knows. But there are a lot of other actors in the market. Local Shops – again you can run your own or ask other shops to sell your products. Maybe you can get a big retail chain to add it to their assortment. Workshops – workshops or other educational formats are an important channel for information and knowledge. And sometimes also for products! Many people buy their first Arduino at an Arduino beginners workshop. Events – Events are good for the exchange of knowledge attention and trust. Fairs and conferences are examples. But I am sure you can think of more experimental ones too. B2B platforms or databases – There is an endless number of platforms databases and networks for communication between professionals. I am sure you can think of some for your business. The product itself – The product itself can serve as a channel in some cases. When you print URLS on it for example. Or when it is something you connect to the internet. Certificates or seals – Certificates or seals can be very important for the exchange of trust. Redhat is a company that makes business with open source software. One thing they do is: They educate and certify developers. This is a valuable service. Because if a company decides to run an open source software they need an expert to maintain it for them. They will look for a certified expert. To be sure the person they hire is able to do the job. Redhat provides the service to test and certify. Ok. So much for the examples. If you know more or have anything else to add. I am happy about your comments in the resources for this video. And now let’s go to the next and final video in this series. It is video number 9 and its about “Value Extraction And Income Sources”. Where does the money comes from? With information added to the squares 1 2 3 4 5 you have now everything in place to start to think about extracting value. Or in other words: Define revenue streams. Some people when discussing Open Source Business Models only look for income sources. But this is the most boring part of everything. Because the income sources are no different from the income sources of other businesses. Well the only opportunity you don’t have is licensing out patents of course. Now. The income sources are manifold. I’ll give you some examples. Smart people will be able to think of more. It is clear that you can activate several income sources at the same time. As many companies do. Sell Physical Products – Like SparkFun or Arduino or many other open hardware companies do. High quality well made and useful physical objects will always find customers. SparkFun sells in their shop products they made themselves but also products made by others. Sell Services produced with Open Source – If you provide a service like energy for example. 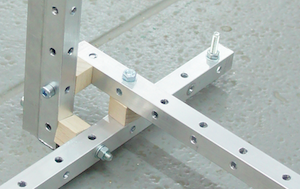 Why not use open source hardware to produce it? This might enable you to produce it cheaper and better. Because you can benefit from the advantages of Open Source. An example for this – is the “Open Compute Project” – where companies like Facebook Google Apple Intel and others develop together data centers – as open source hardware. [https://en.wikipedia.org/wiki/Open_Compute_Project]. Because these companies don’t compete on the level of servers. They compete on the level of quality in the services they provide using servers. Sell The Service – Of Individual Installations or Customizations – You can sell extra services like customizations or installations. Everyone can find out how to install and customize a Wordpress page. But for a really good looking page you’ll hire a wordpress professional. An often told story is that in the early Arduino days the founders were also hired for professional prototyping. And because they could benefit from the already growing Arduino ecosystem they were often unbeatable fast and creative. As said earlier. Open Source is not DIY. In most cases you’ll hire a professional. To set it up correctly and nice. Sell The Service or Meanings to use Open Source – As I told you in video number 3 Auttomatic the company behind Wordpress makes an income with professional hosting. This makes it easier for people to directly start with Wordpress. Another example is I Fixit [LINK]. I Fixit is a website and company that provides tutorials how to repair things for example Smart phones. The tutorials are free and open on the I Fixit website. Everyone can study them. And I Fixit makes an income by selling tools. Sophisticated tools you need to repair sophisticated devices like smart phones. Their open tutorials enable repairing. And their tools make it happen. Usage Fees – Access over ownership. Rent out or lease out your products. Or your space or your machines. The web is full of open source files for objects to 3d print. And also with tutorials how to use a 3d printer. But why should you have a 3d printer in your home? So you go to your local fablab and pay a fee to use their printer. And this is just one of many many possible examples for usages fees. Sell Education or Consulting – Education and consulting is always worth something. Offer workshops trainings or individual consulting. And think about certifying the skills of people – like RedHat is doing as I explained in the video about Channels Of Exchange. ”Franchising” – As I explained in Video number 2 – In Open Source the brand is still protected. It is an important asset for trust. If you take care of your brand and the quality it stands for others might want to use it. Allow them to use it after you checked the quality they produce. Sell Event Tickets – Open things are a good reason to celebrate and connect around them. Provide the space and infrastructure and people might be willing to buy tickets drinks and more. Research Grants – Many innovative companies are part of funded research consortiums. And it is a fact that public funders are more and more leaning towards openness. The European Union for example pushes hard towards open science. And we have good reasons to expect that in the future this will be the case in other areas too. “Publicly funded research should be publicly available” is what more and more people think and say. So going the Open Source road will raise your chances here. Donations – Not a usual income source for companies. But for some projects a donation button or the use of a service like Patreon or Flattr might be a good option to generate some income. Advertising – Shared resources create attention. And attention is worth something. Maybe elegant ways for advertising can be found. At Mifactori [http://mifactori.de] we provide detailed documentation for our products including a complete Bill Of Materials. In the Bill Of Materials we link to the sources: Where have we bought the parts. Nuts and Bolts for example. We received an email from someone asking us if we could imagine in the documentation of our next product to link to their page for the nuts and bolts. And they offered us money to do this. And although the communication stopped. And we don’t do it right now. I think it could be a viable option for the future. We will be transparent about it then of course. The Foundation or Consortium Model – This is a bit more complex to understand than the other points before. The Foundation or Consortium Model we find several times in the world of software. One example is the Document Foundation. The Document Foundation takes care of “Libre Office” – a very well working Open Source alternative to Microsoft Word. Foundations like the Document Foundation often have large companies as members. Google for example. Those members pay large members fees. And they make also other contributions like hiring a full time developer to work on the open source project. Why are these companies become members of these foundations? Because they have a strong interest that the software exists. Google for example has a strong interest that an alternative to Microsoft Word exists. And the Open Source operating system Ubuntu for example has also a strong interest that an Open Source alternative to Microsoft Word exists. As members they help to ensure that the software exists. But they don’t have to take on the whole complex project alone. Foundations help to create synergies. Another way to create synergies are consortiums. In a consortium several companies join together to do one shared project. And Open Source can be a great collaboration methodology for this. As part of a consortium and to a lower extend as member of a foundation you can influence the project. All in all foundations and consortiums are viable ways to fund Open Source projects. One more thing to mention here is cooperatives. Cooperatives are also a group of people or companies that collaborate with each other not through the market. And create synergies in different ways. I’ll add more about cooperatives in the resources for the video. Ok. So much for the income sources. If you know more please add to the resources. This was the last video in the video series about “Open Source Business Models for Circular Economy” produced in the context of the “Open Source Circular Economy Days”. I invite you to work with the tool I presented. I think it became clear that it’s not going from square 1 to square 6 and being done. You have to jump back and forth between the different squares. Add things. Take things out. Add them again. And so on. Till you finally drew a picture that looks like something that might work. Still you might find that figuring out and Open Source Business Model can be tricky. But figuring out new Business Models is always a bit tricky open or not. And the circular economy needs new businesses. And if you can’t find the right angle now. What to do then? I’d say just publish the information! This might enable others to find a working open business model. And if they found it you can probably plug in and become a part of a growing ecosystem. Enable others to do what you can’t. That is the Open Source spirit! Start the collaboration. Be pioneers! Ok. Thanks for watching. And one last time: Please visit the resources for this video to find out more give feedback ask questions and contribute to the discussion. Help to make this tool better. And I invite you also to visit my personal website – Lars Zimmermann Dot De - [http://larszimmermann.de] to find similar stuff or to find out how you can support me or to partner up. Like it? Please consider to support my work. How can I protect my Open Source project from being ripped off? OSCE, what does it mean? The Video Series is finally finished and published. I am happy about your feedback. I know, the sound in the videos is not very good. But you can read the script and will be faster with that anyway. Some pictures with examples of use of the TOOL you can find in the comments here. If you have created your own, I am happy about an upload. They are exceptional, thank you Lars. Hey all, please do your homework: watch and comment on the series. It’s great fun, not a chore. You will have to pass an exam in September! (just kidding, of course). It is also an answer to many questions on the forum on what is this thing, OSCE. This is a question we want to leave behind in the 2016/17 cycle among our community members and move into doing, making and educating others. @seigorobinson and I are giving a talk at the 2017 Disruptive Innovation Festival on this. It will be on later today (4pm GMT). Seigo used the canvas for this for IKEA (explanations are here). 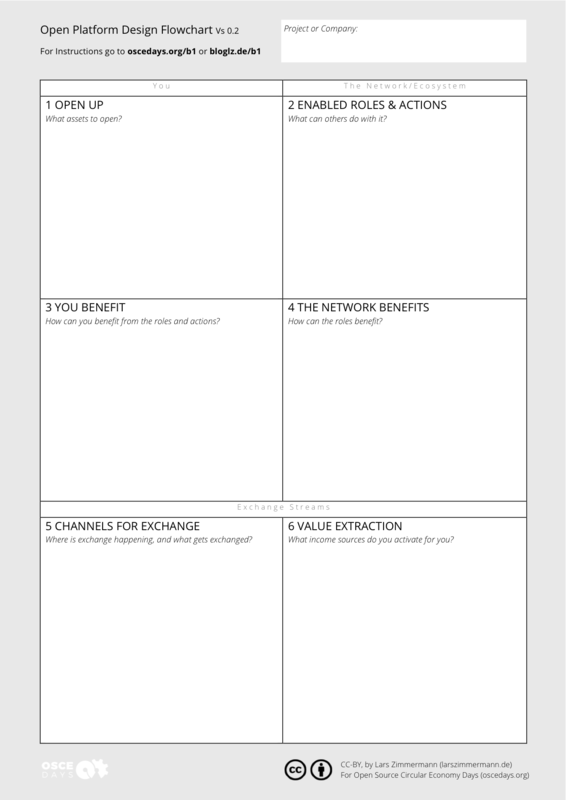 In Danish Design Centre we have also been using Lars’ great Openness Discussion tool for our REMODEL programme (10 Danish manufacturing companies pursuing new open source-based business models and strategies, funded by the Danish government).